Dubai, United Arab Emirates, February 27, 2019: In line with the UAE Vision 2021 goals for a smart, sustainable society, Al-Futtaim Toyota and Citi Taxi in Sharjah are investing into a better future with Toyota Hybrid-Electric Vehicles (HEV) to help ease the burden on the environment. Citi Taxi has bolstered its ranks with 450 Toyota Camry Hybrid Electric Vehicles currently on its fleet, directly contributing to reducing pollution on Sharjah’s streets. This amounts to around half of the company’s fleet comprised of Hybrid-Electric Vehicles, producing on average 53 per cent less harmful emissions compared to a conventional vehicle and saving significant amounts of fuel with the Camry Hybrid’s range of around 26km per a single litre of petrol, under standard operating conditions. 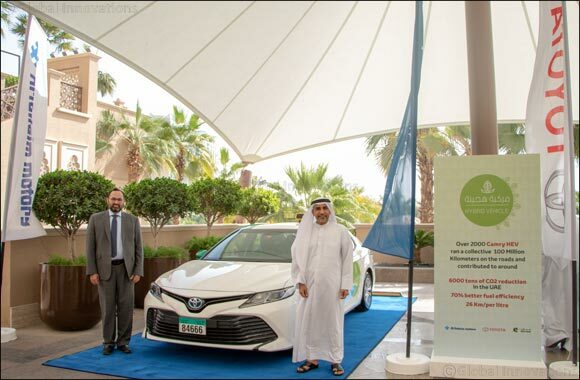 To recognize Citi Taxi’s efforts to boost sustainable transportation in the Emirate, Al-Futtaim Toyota held an event to show their appreciation. The event was held in the presence of Shaikh Majid bin Hamad Al Qasimi, Chairman of the Board of Directors, Citi Taxi Sharjah, Abdul Aziz Al Jarwan, Director General of Sharjah Roads and Transport Authority, Shaikh Saqr bin Sultan Al Qasimi, Director of the Franchise and Transport License at Roads and Transport Authority – Sharjah. By 2025, every model in the Toyota Motor Corporation line-up around the world will be in some way electrified and by 2030 the company aims to have sales of more than 5.5 million electrified vehicles. In the UAE the government is proactive in support of electrified cars and in 10 years it is expected that 10 per cent of the cars on the nation’s roads will be electrified to improve the quality of life for residents through a cleaner and healthier environment.